The musculoskeletal system provides the body with structure, stability, and the flexibility required to move freely. This system is composed of bones, muscles, ligaments and tendons. Joints, the areas in the body where two bones meet, are also an important part of the musculoskeletal system. 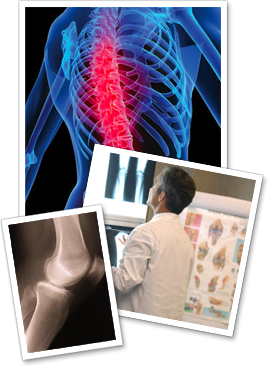 Orthopedics is the medical specialty devoted to treating the range of injuries and illnesses that affect this system. Orthopedic injuries and illnesses affect the entire body but are commonly seen in the hand and upper extremity, back and spine, hips and the foot and lower extremity. Common joints that can experience an injury or illness include the shoulder, elbow, knee and ankle. Some conditions, like arthritis, can occur as a result of age related wear and tear while others, like fractures, typically occur as a result of trauma. Physical therapy can be useful for treating an orthopedic injury itself, or to help with rehabilitation following treatment by a surgical procedure. The main focus of treatment is restoring a patient’s range of motion and reducing any pain and instability. Any patient forms capable of being downloaded by patient to fill out before coming to office.